Visnova - "Poses with Attitude"
He has a powerful drive to succeed in bringing as much realism to the IMVU avatars as possible... 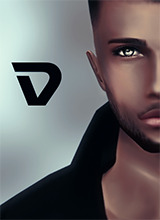 He started developing content for IMVU since April 2007. With already being specalised in poses and avatar actions, he continues to develop skills in all aspects of 3D Development. He loves to take risks and believe the only way to suceed is by doing so. WhiteLilac - "If I had horses I could ride off into the sunset!" Developing in IMVU for over a year, enjoys creating lovely things for lovely people. Re-texturing Scenes, furniture, and clothes are her specialties! Hopes to one day learn how to mesh and exceed in learning more html and complex computer things. Loves arts and crafts... and think thats what got her into developing... it's an art! cindypoo - "Be you, Express yourself." As a graphic designer by day, and a developer by night cindypoo has captured the IMVU scene by surprise. 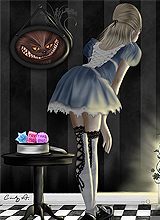 She is also known for one of the most wonderful elaborate Sins collections on IMVU. She hopes to learn more and will always continue to make quality products on IMVU. cybersub - "Virtual Slave to Fashion"
Virtual world's own cybersub, enslaved in all the pleasures that virtual life offers. Creator of women's fetish wear, modern home furnishings and great custom hair textures.